You drive past them every day. As tall structures, they dominate the horizon. They are also the two most enduring, stable, federally designated bench marks of Schaumburg Township. One is the WGN radio tower on Rohlwing Road in the very eastern part of the township. The other is officially called a horizontal control station and it is the Hoffman Estates water tank in the center of the township at the intersection of Golf, Higgins and Roselle Roads. It is largely because of their height that they were chosen as bench marks by the federal government in 1956. As noted by the National Geodetic Survey in Geodetic Bench Marks , “bench marks are long lasting points for which elevations have been determined, used to control other surveys and to monitor movement of and within the earth’s crust.” They are points of reference that surveyors might use when building a road, constructing a building or laying out a subdivision. Proper bench marks are selected based on the stability of the soil and location; low susceptibility to damage, destruction or movement; availability to users and lack of surrounding vegetation. 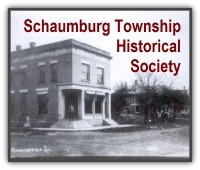 Because both of Schaumburg Township’s two key bench marks were established in 1956, I was curious about the timing. I contacted the National Geodetic Survey in Washington, D.C. to ask if this date was significant. Was the Survey routinely sending out their field teams to establish bench marks in the area? Or did the coming development warrant the establishment of some local bench marks that surveyors could use when laying out subdivisions and other developments? The WGN tower was built in 1938 so it had been here for a while. 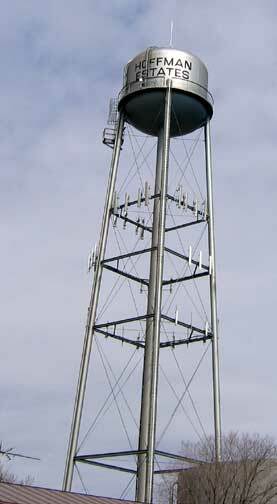 On the other hand, the Hoffman Estates water tower was built in 1955, a year before the bench marks were established. Unfortunately, the National Geodetic Survey could not establish the significance of the date. I then talked to a local engineer who’s been in the field for years and he said that there would have been a team who would have surveyed the entire area. The Survey in Washington had mentioned that their teams were 3-8 people. It stands to reason that, with a team that large, they would have been surveying the area in a methodical manner. Obviously, these two structures provide a multitude of purposes–whether it is broadcasting, providing water, acting as a cell tower or being a focal point for local surveyors. All of that height has to be good for something!